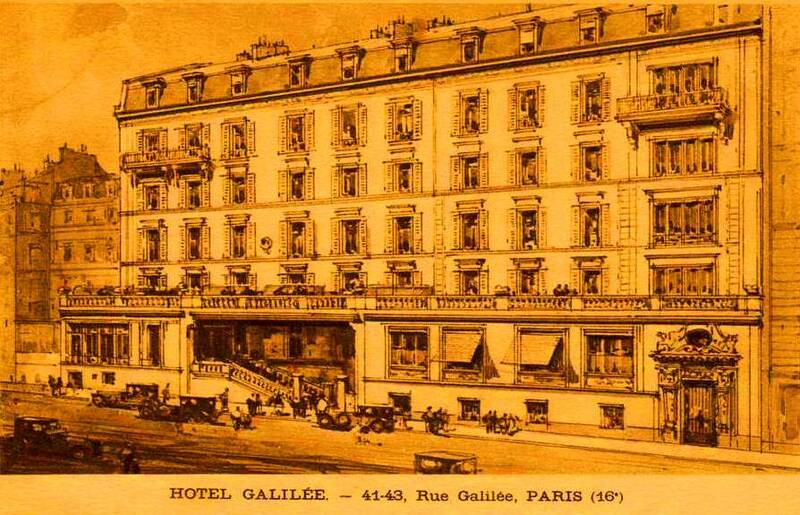 While in Paris, Set installs himself in the Hôtel Galilée, the scene of much action. The hotel stood almost directly opposite the apartment in which James Joyce and his family were living in 1933. “We … settled for a while in the Hôtel Galilée, a small hotel in the affluent quarter near the avenue Klebér. It is strange how I remember the names and peculiarities of the hotels we stayed at when I was a child. At the Hôtel Galilée I recall being fascinated by the type of elevator I had never seen. Small and extraordinarily slow, it was pushed upward by a thick, shiny stem that smelled of engine grease. When the button was pressed to call it down, it gave out a hissing sound, almost an asthmatic sigh of resignation, before agreeing to make its journey back to the ground floor. I also recall another puffing sound coming from my disagreeable Uncle Herman after dinner as he voluptuously smoked one of his enormous cigars in the narrow hotel lounge. He would watch the near-perfect circles of smoke that issued from his pursed mouth, while the grayish ash at the end of the cigar got longer and longer. My uncle explained – when he deigned speak to me – that the length of the uncrumbled ash proved the quality of the cigar. I kept hoping that the ash would crumble and fall, but it never happened. He always made it fall himself by a wilful flick of his forefinger, just in time. All the while, he kept sniffing the side of the cigar and watched the increasing length of the incandescent ashes with a mixture of scepticism and self-satisfaction that I found odious. Enter your email address to subscribe to the Great Author newsletter and receive notifications of new posts by email. Red balloons appear in Set at Random. This image was inspired by a film, The Red Balloon (French: Le Ballon Rouge) which was written, produced and directed by Albert Lamorisse. Why does movie title disturb Set? Giveaway ends February 03, 2019. Copyright © 2019 Set at Random. All rights reserved.